Short Term Medical plans are cheaper because they are riskier. They have more stipulations and tend not to cover co-pays or prescriptions. These plans are great for younger healthier people that don’t have any pre-existing conditions because short term plans DON’T cover pre-existing conditions. Pre-existing condition is anything you may have been treated for, or diagnosed with, in the past (usually 2 years) So if you were treated or diagnosed with something related to your lungs, nothing related to your lungs would be covered if there was a big claim. Some pre-existing conditions might make you ineligible to even purchase a short term plan. Major Medical Plans can NOT refuse to cover your pre-existing conditions. Were just talking about these short term plans. 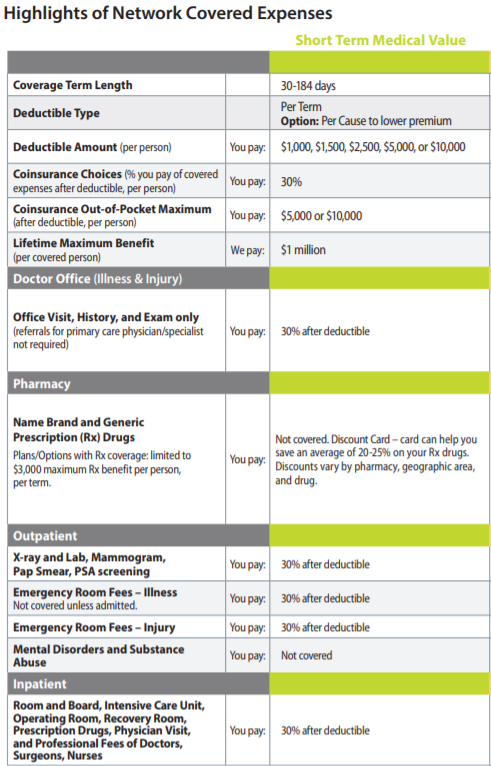 Annual or Lifetime Maximums of $750,000 or $1 or $2 million are common caps on how much the insurance company will pay out. So to sum it up, these plans are perfect for a young healthy person or family that has no prior major medical issues, no current prescriptions and wants a much cheaper price on heath insurance. If your on the fence at all give me a call and I’ll explain all of your options including going without insurance. You should select a $5000 Deductible. Per Term, which means multiple accidents or illnesses add up during the term. Select a $5000 out of pocket max. These plans start tomorrow by default so make sure to switch the dates if you want it to start later. Be sure to click on the plan Brochure: Plan Benefits, Exclusions, Limitations pdf link to look of the fine print of the plan. Click this blue banner below to be taken right to my Short term quote page with UHONE. Contact me if you have any questions or hit any snags at all. Seriously I like to help people so call me if you get frustrated or confused.